As a Licensed Locksmith and member of the North Carolina Locksmiths Association, you can be sure that I am held to strict ethical and professional standards by both my peers and the state licensing board. By my being a Registered Safe Technician with the National Safeman's Organization you may rest assured that I have tested and been passed on by some of the finest safemen in the nation. With all my professional affiliations, there is a component of annual continuing education to keep me current on my certifications and abreast of trends and new technologies in the physical security field. A Locksmith can be like a Lawyer or a Doctor, when you need one you want a good one who will be there for you. Who will put your needs to the forefront, and provide you with the highest quality professional service. 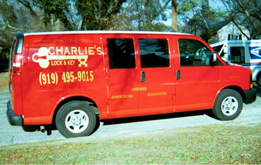 At "Charlie's Lock & Key" , that's what I do. Are your employees constantly looking over their shoulders, or are they tending to your business feeling secure on the premisses? Weather you have moved your family into a new house and don't know how many keys the previous owner left floating around, or you are stuck in a dark parking lot with the keys locked in your car...call me I can help. As a business owner you have property to protect. Whether it's employee access control or a safe for your proceeds. Security is a financial concern, are your locks doing their best for you? As a home owner, you have worked hard to provide for your family. Your home, your garage hold the fruits of your labors. Is all that you care for as secure as it could be? Mobile Service Van right to your door. I will give you the best service at the best price that I can first time every time, because that is my philosophy. Trying to put the service back into the service industry one satisfied customer at a time.